As Evelyn is growing up she is showing more and more interest in toys especially anything musical or soft toys that she can cuddle. 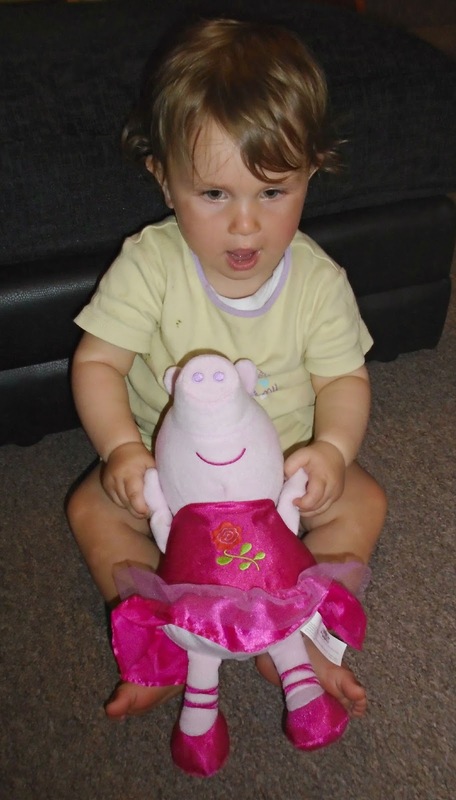 So when we were asked if we would like to review the Peppa Pig Princess Rose plush toy I knew this ticked all the boxes for Evelyn and immediately said Yes. 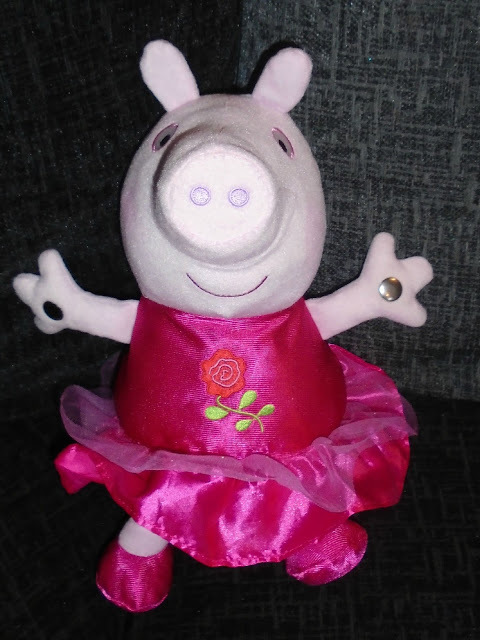 The Peppa toy is very soft and Peppa is wearing a pretty pink silk and net skirt with matching shoes making her look very girly and sweet. Details such as the eyes, nose and mouth are embroidered on which I really liked as it made the toy much safer for Evelyn to play with. So how does Peppa work? Well you simply gently touch the 2 silver sensors one on each of her hands and she starts singing "Ring-a-Ring-a-Roses". The sensors are really sensitive and only have to be lightly touched for Peppa to start singing which is great for children. Evelyn did require some help to get her signing but she is still quite young. James however was intrigued by the toy and got the hang of it straight away. Since then James and Evelyn have been playing with it together repeatedly and Evelyn seems to have grasped the concept of holding one of Peppa's hands whilst James holds the other and shrieks when she starts singing!. The Peppa Pig Princess Rose is operated via a battery pack which is hidden beneath a velcro strip to her back, this is covered and packed in with plenty of stuffing and doesn't effect cuddling her in fact it can barely be felt. 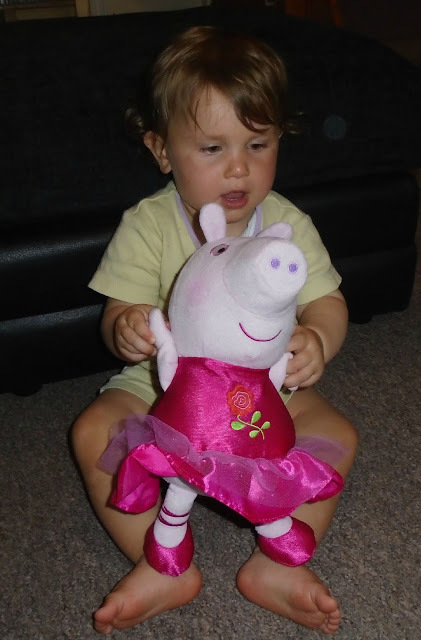 What I love about this toy is that unlike some other interactive toys Peppa Princess Rose is versatile and can be either played with by 1 child or lots of children meaning this toy isn't limited to a certain number of children and can still be played with even when the child is not with friends or siblings. A great toy for any Peppa fans from 18 months + that will not only provide a very cute toy to snuggle with but hours of fun and music. You can purchase your own Peppa Pig Princess Rose from Amazon priced at £19.99. That is such a cute toy.